NASA's Mars Curiosity rover is about half way to its first major scientific target, a region known as Glenelg where three different terrains come together, but the science team plans to pause a few days to perform the mission's first "contact science," using instruments on the vehicle's robot arm to photograph and chemically assess a pyramid-shaped rock, project managers said Wednesday. Data from the arm-mounted Alpha X-ray Spectrometer will be compared with remote sensing data from another instrument known as Chemcam that uses a powerful laser to vaporize tiny sections of a target's surface. Debris from the laser struck is measured remotely to help determine chemical composition. "The science team has had an interest for some time now as we're driving across the plains to find a rock that looks like it's relatively uniform in composition to do some experiments between ChemCam, which we've been acquiring a lot of data with, and APXS, which we haven't used yet on a rock," said John Grotzinger, the Mars Science Laboratory project scientist. "Both of those instruments could make a measurement and there could be differences between the measurements because one is measuring at a small scale (ChemCam) and one is measuring at a larger scale (APXS). These rocks that we drive by on the plains here that look dark, they probably have basaltic composition. That's a familiar material to us." The rock chosen for the initial APSX measurements, and closeup photography by the Mars Hand Lens Imager instrument, has been dubbed "Jake," named after Jacob Matijevic, a Jet Propulsion Laboratory engineer who died a few days after Curiosity's Aug. 6 landing. "The hope is we can analyze this rock and then do a cross comparison between the two instruments," Grotzinger said. "Not to mention it's just a cool looking rock there, sitting out on the plains with almost pyramidal geometry, so that's kine of fun as well." Curiosity is expected to spend three to four days collecting data from MAHLI, APXS and the ChemCam instruments before resuming the trek to Glenelg. New photographs from Curiosity show the approach to Glenelg and a stair-like series of steps Curiosity will need to negotiate to reach the heart of the target zone. "We really do think it's going to be interesting," Grotzinger said. "You can see a light-toned (rock) unit, which we believe to be material that from orbit has this signature, this property, of having relatively high thermal inertia. That's the ability of a material to retain its heat. 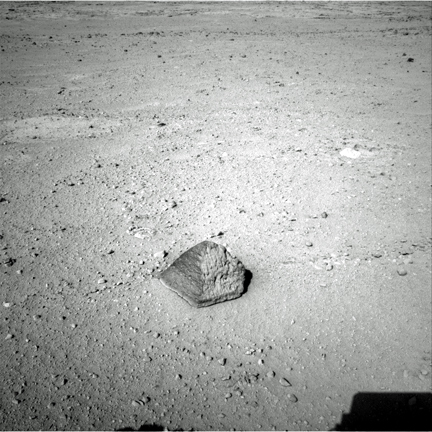 So late in the day or at night, orbiters are able to observe this rock well because it seems to be giving off heat late into the day and night. We don't know what the reason for that is, but it's always been a bit of a beacon for us and we're getting closer and closer to it." 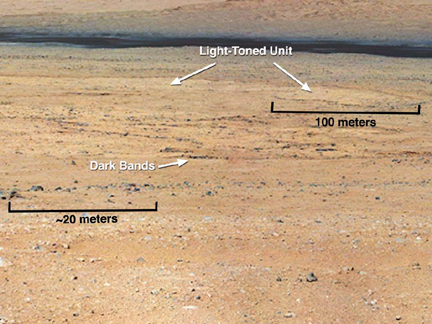 As for getting there, Grotzinger said the Curiosity will have to descend several yards, passing through darker layers that may be inter-bedded with the denser, light-toned material. "We can also see in the (orbital) data that we can detour around that and kind of contour our way down into those lower reaches where we hope to do the bulk of our investigation at that Glenelg region," he said. "We have all the tools we need to get into this exciting area." Curiosity's long-range goal is the base of Mount Sharp, a 3-mile-high mound of layered terrain in the center of Gale Crater that is expected to provide major insights into the geologic history of Mars and whether or not any organic compounds might be present like those required for life as it is known on Earth. 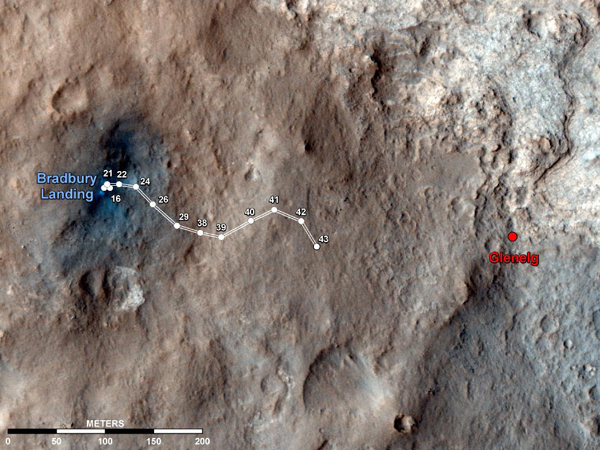 Mount Sharp is five to seven miles away and Curiosity is not expected to get there until early next year. 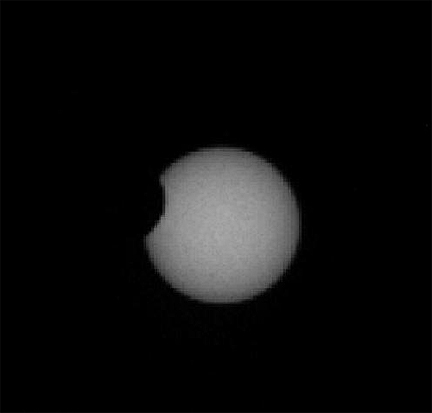 Along with studying martian geology and weather, Curiosity's cameras also are doing a bit of astronomical observing, photographing Mars' moons Phobos and Deimos as they pass in front of the sun. Using faster cameras than those available on earlier missions, scientists are able to precisely time the events and in so doing, measure the satellites' orbits with unprecedented precision. By studying how the orbits change over time, researchers can gain insights into the internal composition of Mars and the moons as tidal forces affect their passage. Based on earlier observations, it appears Phobos, for example, will break apart under stress from Mars' gravity some 10 million to 15 million years from now. "Why do we take all these images of these two little moons crossing in front of the sun?" asked Mark Lemmon, a science team co-investigator at Texas A&M University. "For one thing, they have tidal forces that they exert on Mars, they change Mars' shape ever so slightly. That, in turn, changes the moon's orbit. Phobos is slowing down, Deimos is speeding up like our moon is. This is something that happens very slowly over time. "Phobos will eventually break up and fall into Mars and with the transits, we can measure their orbits very precisely and figure out how fast they are doing this. The reason that's interesting is it constrains Mars' interior structure. We can't go inside Mars, but we can use these to tell how much Mars deforms when the moons go by." By precisely timing the transits, "we get information on Mars' interior structure," Lemmon said. "We think the precision of these measurements ... will also tell us something about Phobos' insides and whether it's uniformly dense or if there are variations."